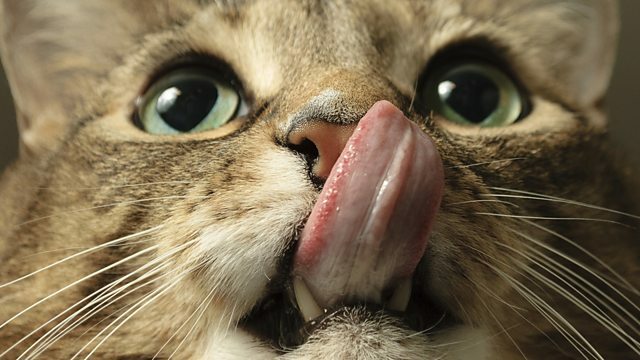 BBC Learning English - The English We Speak / Cat got your tongue? Feifei's unusually quiet today – maybe it's got something to do with the cat that Rob has brought into the office? But what has the cat's tongue got to do with it - or is there just some confusion about another English expression? Hello and welcome to The English We Speak. I'm Rob, and joining me is Feifei. Are you ok? Have you got a cold? No, not a cold. Something's making me sneeze. Errr... Rob, is that a cat on your lap?! Yes. Meet Tiddles. I decided to bring him to the office because he gets lonely at home on his own… don't you Tiddley-widdly? It's a good idea, don't you think? Feifei? You've gone all quiet – you've usually got something to say. Feifei? Can you speak? Cat got your tongue? No! Your cat has not got my tongue – or anything else – I'm allergic to cats. Oh dear Feifei - but saying 'cat got your tongue?' means 'you're very quiet' or 'you've got nothing to say'. What's the matter? Cat got your tongue? I did say we'd use up all our money on the car! A: Has the cat got your tongue? You usually go on about how amazing your boyfriend is. Oh I get it now. You weren't saying much because you were too busy sneezing! No Rob. I was angry because you know I am allergic to cats – don't you remember me saying that I can't be in the same room as one? Rob? Rob! What's wrong? Cat got your tongue now? It appears Tiddles needed the toilet… but it's too late now. I'm all wet! Oh Rob. You stink! I'm off. Bye.